The art of ancient Greece has exercised an enormous influence on the culture of many countries from ancient times until the present, particularly in the areas of sculpture and architecture. In the West, the art of the Roman Empire was largely derived from Greek models.In the East, Alexander the Great's conquests initiated several centuries of exchange between Greek, Central Asian and Indian cultures, resulting in Greco-Buddhist art, with ramifications as far as Japan. Following the Renaissance in Europe, the humanist aesthetic and the high technical standards of Greek art inspired generations of European artists. Well into the 19th century, the classical tradition derived from Greece dominated the art of the western world. Greek There are 3 products. Orange colour cup with two large handles. 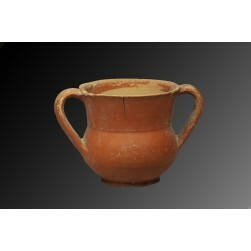 Price: € 275,-- Size: 13 x 8,5 cm Period: c. 400 B.C. Material: Pottery Condition: crackline Provenance: Private Dutch collection H.P.